Today I'm going to share something about myself that I don't usually talk about. Most of time when I try to explain this thing to people, they think I'm crazy. The first time I realized I had a strange way of thinking was when I was a little girl. I was trying to explain to my mom my thoughts on the colors of the alphabet, and I remember noticing how confused she was. To me, when I look at letters or numbers in my mind, they all have colors. I have no idea why. They just do. Sometimes it's helpful to me. For instance, I can recall someone's address or phone number by remembering what color it was. A couple of days ago I found out that they actually have a freaking name for this bizarre thing that I do! It's called color synesthesia. I found a research site, and I took one of their tests. 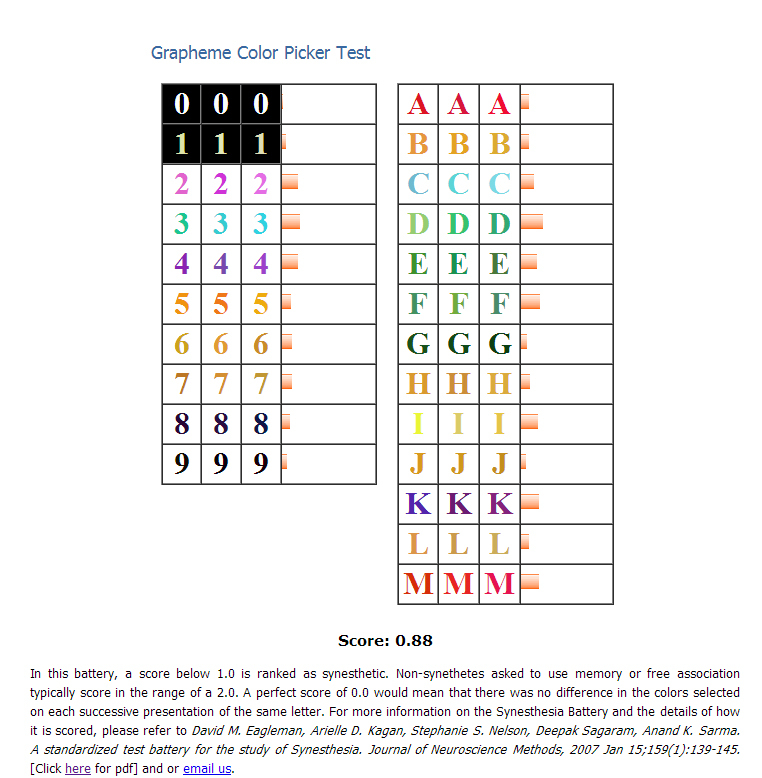 You have to answer what color goes with what letter or number. All the letters and numbers are in random order and it's a timed test. What was interesting to me was that I hadn't noticed before that there was a somewhat rainbow pattern to my letters and numbers.